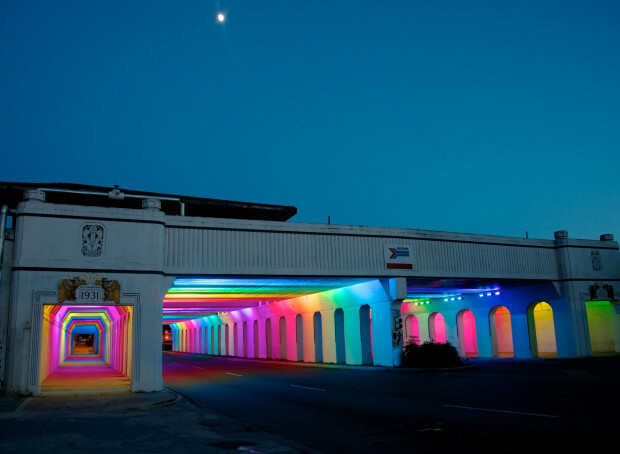 LightRails is a computerized LED light sculpture commissioned by REV Birmingham for the downtown railroad underpass located at 18th Street in Birmingham, AL. This underpass is an important connection between the city center and a new urban park that has quickly become very popular with the public. The underpass is about 70' wide by about 225' long. The LED computerized light system has over 150 LED fixtures and are manufactured by Philips Lighting/Color Kinetics. The underpass is designed for both pedestrian and motor vehicle traffic. The 18th Street railroad underpass is a connection between the city center and the new and exciting Railroad Park. The underpass was somewhat intimidating for pedestrians and often attracted vagrants. The main goal for this commissioned artwork was to transform this underpass to an engaging and inviting urban experience. I felt that it was essential for the artwork to be site specific and harmoniously celebrate the architecture of this art deco underpass. 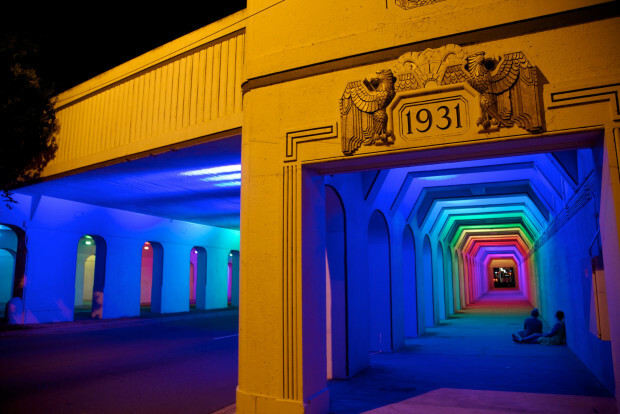 The design of this underpass actually provided a superb built environment for a light sculpture. The series of archways and flat white surfaces was an excellent environment for a sequential light program. The commissioning agent for the city of Birmingham was REV Birmingham, a non-profit that creates catalytic projects to improve the city. The time schedule was incredibly short- between signing my contract to the “flip the switch” opening ceremony was less than four months. Communication between myself, REV Birmingham and the electrical contractor (hired by REV Birmingham) was critical. Additionally the manufacturer of the LED light system (Philips Color Kinetics) was an essential partner throughout this process. Their technical support and ability to meet our very tight shipping schedule was an essential component to this project. Further credit goes to REV Birmingham for managing coordination with the city of Birmingham. LightRails has received a very successful response from the public. The 18th street railroad underpass has transitioned an unwelcoming environment to an engaging and exciting urban experience. 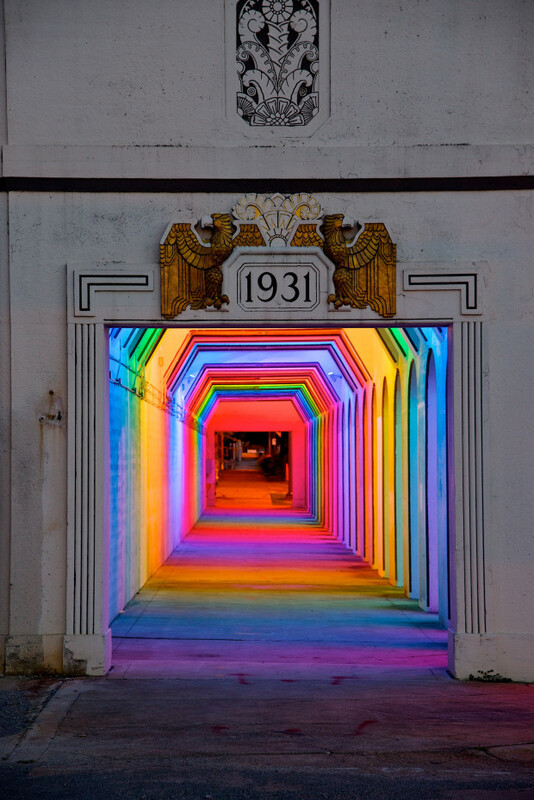 LightRails has changed an unwelcoming underpass into a transformative site that is becoming a downtown destination -even couples are having their wedding photos taken in the artwork!